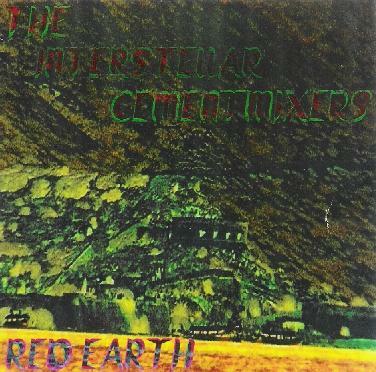 The Interstellar Cement Mixers - "Red Earth"
The UK duo of Stephen Martin and Richard Collins, aka The Interstellar Cement Mixers excel at improvised, analogue, deep space expeditions. Their latest album, Red Earth, contains some of their best trips yet. There are just four tracks on the album, ranging in length from 14 to 24 minutes long, for a total of just under 80 minutes of pure interstellar and extraterrestrial planetary exploration. Waxed Crafter gets things going with vast pulsing waves of energy punctuated by mournful wails and distant cosmic storms. Ganglion Ministry sets down on an alien world, with some eerie 1950's sci-fi movie atmospherics and strange twittering sounds, like extraterrestrial mice running through the works. Layer upon layer of spacey atmospheres slide into the mix as the piece progresses towards its gently spaced out conclusion. Velcro Sunrise continues the exploration of alien worlds with blubbling, flowing liquid electronics and huge swaths of melodic synths murmuring their glacial melodies. And it's back into space again with the final track, Magnesium Universe, taking the listener on a slowly evolving musical voyage from the glowing core of our galaxy to the icy outer reaches of the universe. Absolutely wonderful stuff! This is great stuff for popping on those headphones and getting lost in. Fans of music like Tangerine Dream's Zeit and Cluster's Cluster '71 will find much to like on Red Earth. For more information you can visit the Interstellar Cement Mixers web site at: http://www.interstellarcementmixers.co.uk.